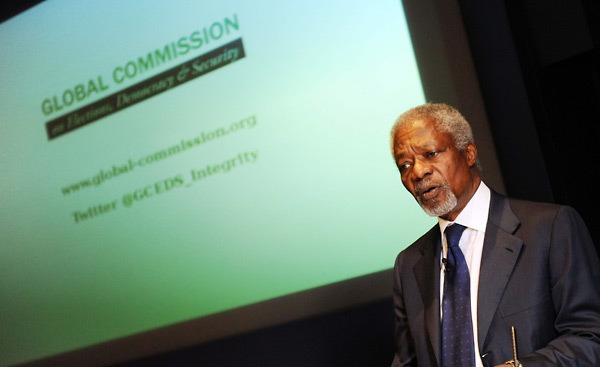 “When citizens go to the polls and cast their votes, they aspire not only to elect their leaders, but to choose a direction for their nation.” Kofi Annan warns that while elections with integrity can bolster democracy, flawed elections can undermine it. In this blog, he discusses the importance of electoral integrity and how it can be strengthened at local, transnational and international levels. As I watch the people of Kenya vote in their historic elections today, 4 March 2013 – the first under the country’s new Constitution – I am reminded not only of the power of elections to bolster democracy, but of the potential damage that a flawed election can inflict on a society. Aside from Kenya, this year will see elections throughout the world, in countries as diverse as Australia, Cambodia, Chile, Germany, Iran and Zimbabwe. In fact, since 2000, all but 11 countries in the world have held elections at the national level. However, while elections have become universal, challenges to the integrity of elections are widespread and are found in all democracies – old and new, rich and poor. Some groups – in particular women and minorities – often face barriers to participation and representation. Uncontrolled, unregulated and opaque political finance has also compromised the equal opportunities of citizens to influence political outcomes, leading to voter apathy and distrust. In many countries, elections continue to be associated with a ‘winner-takes-all’ approach, fuelling the potential for conflict and violence. At the same time, elections have been used to perpetuate the rule of dictators by giving a veneer of democratic legitimacy to autocratic regimes. It was these concerns that led me to convene a group of experts and distinguished former leaders to explore how to promote and protect the integrity of elections. Launched in September 2012, the report of the Global Commission on Elections, Democracy and Security identifies major challenges to electoral integrity worldwide and puts forward recommendations to improve them. Elections with integrity are the foundation of democracy. In a true democracy, our elected leaders are simply the temporary custodians of political power; the power ultimately rests with the people. We elect leaders to act on our behalf so that we can go about our lives, caring for our families, teaching at our schools, staffing our hospitals and running our businesses. At election time, the power returns to the people – and they in turn empower the elected. Elections also provide people in each society with the opportunity to resolve political conflict peacefully. When citizens go to the polls and cast their votes – whether in Kenya, the United States or Indonesia – they aspire not only to elect their leaders, but to choose a direction for their nation. The Commission defines an election with integrity as one that is “based on the democratic principles of universal suffrage and political equality as reflected in international standards and agreements, and is professional, impartial and transparent in its preparation and administration throughout the electoral cycle.” At its core, the ideal of electoral integrity means that all voters should have an equal opportunity to participate in public debate and cast their ballots, all votes are counted equally, and all candidates seeking election do so on a level playing field. As well as conferring legitimacy and public trust on elected officials, and security for the losers, elections are also a powerful catalyst for good governance, security and development. My home country of Ghana experienced a cycle of military coups following independence in 1957, before settling into a series of democratic elections and transfers of power. The new legitimacy of its political institutions enabled both responsive governance and private-sector driven development. Indeed, following the implementation of sound policies including smart agricultural reforms, Ghana is the only country in Africa to have met both the poverty and hunger components of the first Millennium Development Goal. When elections are flawed they corrode public trust, and in severe cases can endanger democracy and even lead to conflict. I saw how harmful flawed elections can be following the disputed presidential elections in Kenya in December 2007. The post-election violence caused tremendous damage and loss, resulting in the deaths of 1,300 people and the displacement of over 600,000. As the country holds its General Election today, I fervently hope that all Kenyans will commit themselves to helping to ensure that the polls are free, fair and credible. Regulating political finance, so that no wealthy individual or interest group can have undue influence over the electoral process. Bearing in mind this set of challenges, the report sets out recommendations for action at national, transnational and international levels. At the national level, governments should strengthen the rule of law and create the institutions and processes – including independent national electoral management bodies (EMBs) – that protect the fairness and transparency of polls as well as deter election-related violence. They should regulate political finance and donations. At the transnational level, EMBs should create a global certification process for elections, by adopting international standards of professionalism, independence and competence against which they agree to be measured. The report further recommends that a new transnational organisation – Electoral Integrity International – be created to grade countries on their elections and sound the alarm when countries fail to meet electoral standards. At the international level, donors should prioritise funding activities that promote and protect elections with integrity, including those that deepen the capacity of domestic election observers. Regional organisations also have a particular role: they should create ‘red lines’ marking what constitutes unacceptable electoral malpractice. And acknowledging the fact that elections are often rigged long before polling day, international efforts to uphold electoral integrity should take place throughout the political and electoral cycle. Of course, the challenges of electoral integrity cannot be resolved by politicians alone. Civil society and the media must be given the space to play their part in demanding accountability and transparency. The ideal and appeal of democracy is found across the world and does not belong to any country, region or culture. It is enshrined in the Universal Declaration of Human Rights, which states that “everyone has the right to take part in the government of his country,” and that the will of the people “shall be expressed in periodic and genuine elections.” At the World Summit in 2005, the Member States of the United Nations reaffirmed that democracy is a universal value. While elections are the foundation of democracy, they do not serve the cause of democracy if they are corrupt; in fact, they give democracy a bad name. By ensuring that elections are held with integrity, we can help fulfil the promise of the Declaration and its supporting international treaties: a world where governments are mindful of the inherent dignity and equality of every individual, and respect their right to have a voice in how they are governed. In this op-ed for The International Herald Tribune, Jimmy Carter analyses the situation in Egypt and suggests what steps must be taken for reform to proceed. 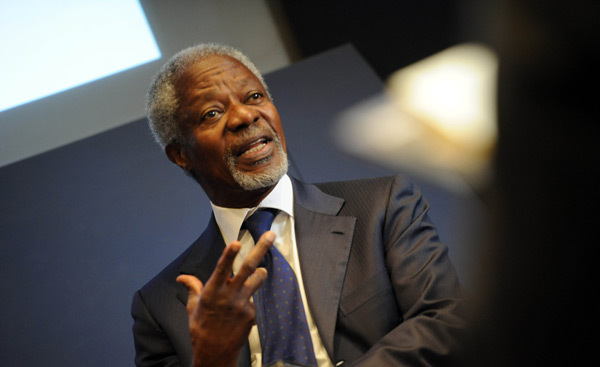 Kofi Annan discusses the crisis in Zimbabwe and argues that we have a responsibility to support its people by helping to ensure a move from division to reconciliation as well as free and fair elections. This article first appeared in The Financial Times.